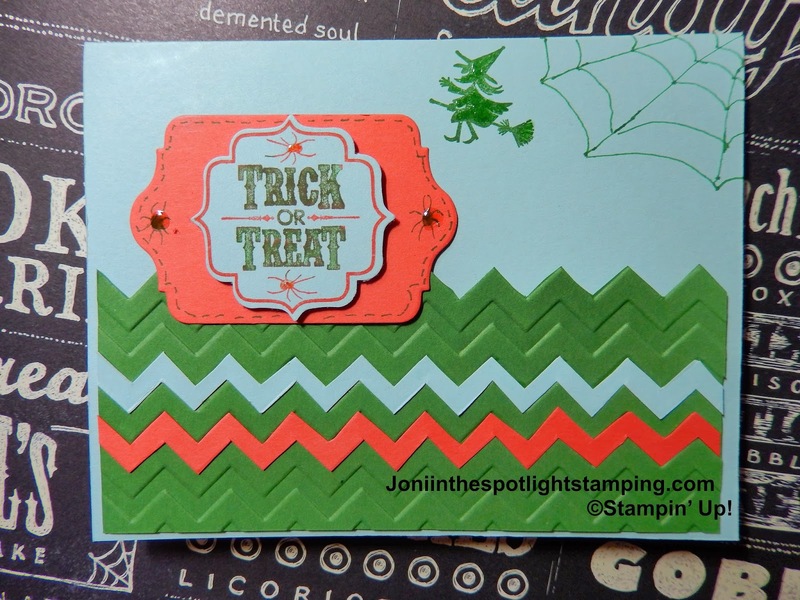 Joni in the Spotlight Stamping: "COLORING DOWN THE SPOOKY LINES"!!! So if you're hopping over from Helen's blog-hope it wasn't too scary over there!-welcome!!! But Beware....!!!! I chose the first group & decided to say Happy Halloween to you all in my own way! Ok, so this card is totally out of my comfort zone! But I just wanted to have fun! I thought it was a cute Halloween card! Not easy using these colors! 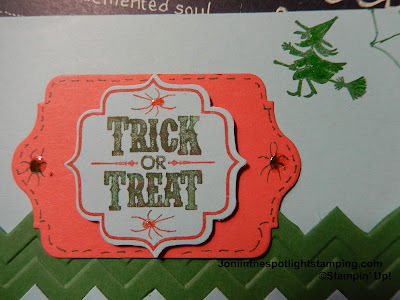 So the stamp set is the multi-purpose & well worth the $ Tags 4 You set from the Holiday catalog! I used it with the Label Bracket Punch! I colored the words with my markers and stamped on the Soft Sky cardstock! I love doing that! Makes fun 2-tone sentiments! Backed it all on some Calyspso Coral cardstock cut using the Chalk Talk Framelits! Kinda fun! 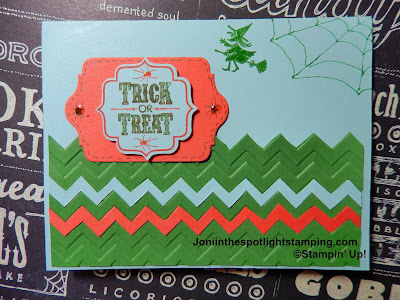 I used the Chevron Textured Embossing Folder & just cut the edges! There's the Garden Green! I did the same on a small piece of the other 2 colors, cut them out, & fit them in the grooves! Now the with is stamped with the Garden Green & topped with Crystal Effects to make her "pop"! She's too cute to be spooky tho! So just wanted to share a fun Halloween Treat! Hope you enjoyed! Now go hop over to Liz's blog & say BOO! Don't scare her tho! Have a save & happy Halloween! Very nice. Let's hope that witch keeps going the same way, so she doesn't get caught in that spider's web. Love the touches on this card. Great job.